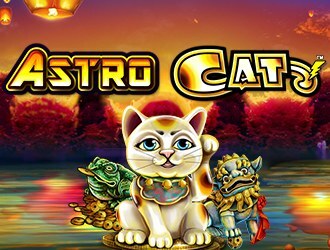 Astro Cat is a game we hadn’t come across before which surprised us, because we at Boku Slots thought we were the online slot masters. Created by Lightening Box Games this Chinese inspired slot is based on oriental tradition including the lucky waving cat. With a unique twist and some nifty features, we’re hope this game brings luck to all its players. Astro Cat is a 5-reel slot (in essence) with a whopping 1,296 ways to win. The reason for this is that reel number 3 is actually a ReelFecta and has 16 symbols that all turn independently of each other on every spin. This increases the chances of a winning combination. However, the symbols can only be used once per winning combination. It is for this reason that we are letting go of the fact that the RTP is only 95.44%, as it does seem quite low when you compare it to other slot games of a similar nature. Bet Amounts – Betting begins on Astro Cat at just 50p per spin, which is at coin value 0.01p. Considering that there are 1,296 ways to win, that’s an affordable spin price in our eyes. You can adjust the coin value which in turn will increase your bet amount. The maximum bet is £500 at coin value £10. Make sure you adjust your coin value according to your balance or betting requirements, before you hit spin. 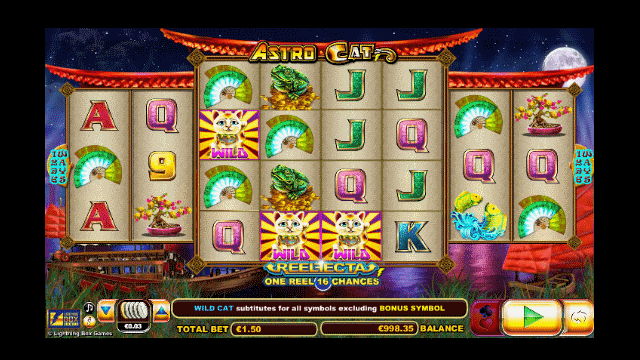 Wild Symbol – The wild in this slot is the Astro Cat himself, he substitutes for all symbols except the firecracker bonus symbol. The wild will only appear on reels 3 and 4 during the entire game. Scatter Symbols – Your scatter bonus is depicted by the firecrackers and landing 5 or more of these across the reels, will award bonus spins. Other Symbols – The rest of the symbols are all of an oriental theme from a beautiful fan, a money frog, a bonsai tree, the lucky fish and of course the lucky dragon. Then there are your lower symbols which include A, K, Q, J, 10 and 9. All the symbols are elegantly designed and very colourful making it easy to watch as they spin. Bonus Spins Feature – Land 5 or more scatter symbols to trigger the bonus spins feature, where you will be awarded with 12 spins and also have the locked wilds added to the game too. The ReelFecta reel will spin and on every new spin you will either land a wild or a poison symbol. The wild becomes sticky or you will land a poison symbol which ends the game. The wild remains in place until the bonus spins are over. It will also award an extra spin, up to a maximum of 12. If you land 3 more scatters on the ReelFecta then you will be allocated 5 extra spins. If you turn the entire outer reel of the ReelFecta into locked wilds, then you enter the mega spin which makes all 16 symbols on reel 3 wild. Gamble Feature – Aside from the bonus fun, you also have the option of gambling each win on the turn of a card if you wish to. Press the gamble button and you will be given the choice of deciding if the card is red or black in colour, or by deciding which suit it is. Double your win by choosing the right colour, or quadruple your win if you pick the right suit. What’s not to love about Astro Cat? Aside from the sound track which can get a bit much after a while. It animates really well on wins with coins spewing out of the slot and the Astro Cat flings itself across the screen. The RTP whilst not great is forgiven with the addition of the ReelFecta, which increases the chances of bigger pay-outs.